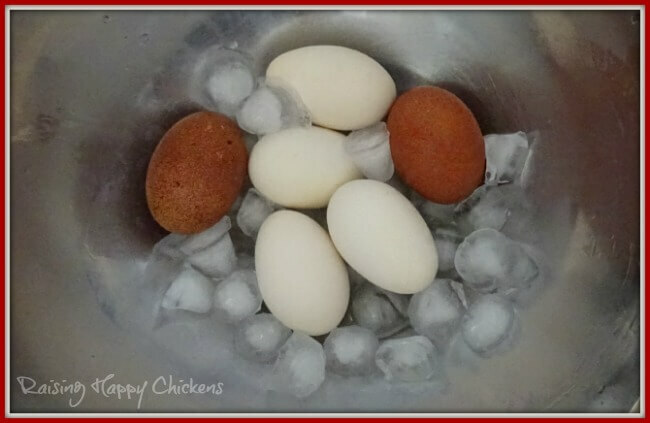 Perfect hard boiled eggs the easy way. 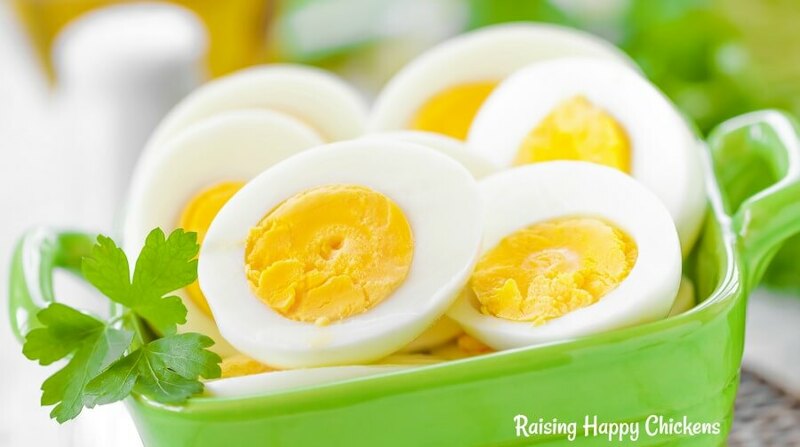 Perfect hard boiled eggs that peel easily every time! 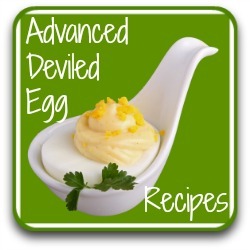 You want to make deviled eggs. You have some perfect, fresh eggs from your chickens. But will they peel without ripping the white into chunks? Well I'm here to tell you there is a way. I only discovered it recently and now I'm going to share it with you. 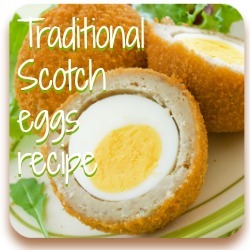 And I promise - you'll have perfect hard boiled, easily peel-able, eggs - every single time! How to get perfect hard boiled eggs : stage 1. I know it sounds extreme for hard boiled ... but honestly - just forget it. You can either use a steamer or you can do what I do (although I may buy a steamer having discovered this) and use a very large pan or pot. Put your eggs into an unbreakable bowl inside it. Fill the pan - not the bowl - with a couple of inches of water, bring to the boil, put the lid on and leave it simmering away for 15 minutes. If you're using a proper steamer they will only need about 12 minutes. 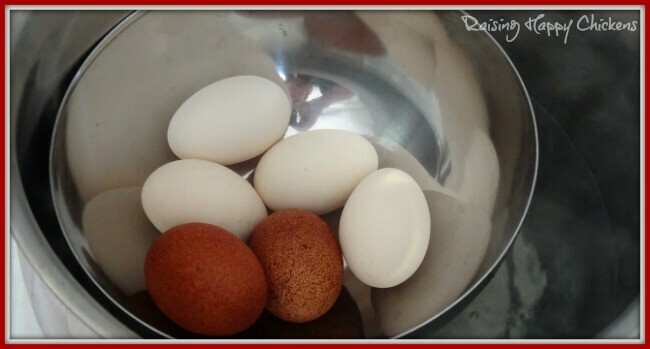 The eggs are in a dry bowl set inside a pan of boiled and simmering water. Incidentally, if you store eggs in a refrigerator (which you really do not need to do, by the way) you can use them direct from the fridge - no need to bring to room temperature. How to get perfect hard boiled eggs : stage 2. A couple of minutes before they're due to finish, put as many ice cubes as you have into a large bowl. When your eggs are done, take them from the bowl or steamer and plunge them straight away into the bowl. If the ice doesn't cover them, use your hands to turn them so that every one comes into contact with the ice. Leave them in there for ten to fifteen minutes. Please note : This will not work as well with cold water from the tap. Ice is the key. How to get perfect hard boiled eggs : stage 3 - peeling. If you're using a recipe which relies on the whites looking nice, you'll discover that this steaming followed by rapid cooling method makes even the very freshest incredibly easy to peel. Usually, if I boil an egg and peel without ice, large chunks of the white come away with the shell. That may be fine for some recipes but if you're wanting them for, say, a salad recipe, it can spoil the look a little. Using the steam and ice method, though, the shell comes away easily and without bringing any of the white with it. It leaves a perfect, smooth white every time. I was so impressed with this method that I put a short video on my Facebook page. This is it, to show you how simple it is to peel shells cooked in this way. Once you've tried the steaming method you will never go back to using the boiling method again. The shells don't crack during cooking, the texture is more moist, the taste is more flavoursome, and you don't get the nasty black ring in the yolk (which I know is harmless but it can look unpleasant in a salad, for example). If you're looking for more eggy pages, you'll love these. Did this hard boiled egg steaming method work perfectly for you? If you've found this page and my website helpful, I'd really appreciate you letting me know by clicking on this button..
...and / or share it by clicking one of these little buttons - thank you!